This story actually starts in the “past” (our Batman’s potential future) where the Joker has been killed and buried in an unmarked grave. This incident leads to two key changes – one is that Batgirl decides to give up the cowl in favor of a badge, going to the police academy. The other is that Batman has decided to create a super-secret morgue simply called the “Vault” for super-villains, hidden so far below the earth (and the Batcave) that no one could possibly ever, ever, ever find the bodies hidden there…which of course leads us to a break-in at this new morgue. But, who could do such a thing? As it turns out, we have a new Parasite-type baddie named Ronald Tagg, who had been thought dead after he had broken into the former Doctor Death’s basement lab, triggering an explosion. As it turns out, Tagg has now found the ability to steal memories, visuals, and even abilities from others, even from the bodies hidden in this super-villain “Vault”…and he is being tracked to…Central City! Cut to the Central City of the Beyond era, and a red and yellow streak moving to stop a robbery in progress by Rigor Morris (yes, that’s the name). Our new Flash is definitely fast, and equally sharp-minded. She makes quick work of Rigor Morris, leaving him with an hilarious toe tag while rushing to her day job at the Flash Museum…and arriving there with apologies for being late once again (great nod to Silver Age Barry). After a talk with her boss she leads a tour through the museum, and we learn her first name is Danica (called “Dani” for short by her boss). We look outside the museum to see the gathering Justice League in civilian duds, interrupted by an Ape Attack (“Groddlings”). The fight brings the members of the Justice League into action…only to find that they may have a MUCH bigger fight on their hands as they get past the apes and into the museum. For that, you need to check out the latest chapters…and of course there are more coming up on your favorite digital comics app on a weekly basis (or you can wait one month for the print roundup). The other stories are excellent – Batman Beyond dealing with the “10,000 Clowns” storyline and Superman Beyond showing a captured Supes dealing with a society that blames him for all their problems and delights in torturing him…slowly… Great stories all, but the new Flash debut is worth the price alone for any speedster fans. The story by Derek Fridolfs handles this format (one chapter per week for digital download) exceptionally well. With a limited page count, this story is gripping – and managed to throw in several twists in a short amount of time without coming across as forced. Yes, the villain name Rigor Morris was cheesy, but it was obviously meant to be so, and it was a welcome laugh. I also appreciated the many nods to the Silver Age, from the tour of the Flash Museum to Danica’s habitual lateness for work. The artwork is stylized for weekly digital distribution, so it is definitely a different look than you may find in the mainstream New52. Still, Jorge Corona (pencils) , Derek Fridolfs (pulling double duty as inker), and Nik Filardi (colors) do an great job in bringing us this new Flash. Incidentally, the print version of this story does not include a full shot of the new Flash in costume – the cover shot for the digital version (noted here) does give you a view of the red, black and gold costume. To me, this is an excellent design and fits in very well with the Justice League of the Beyond-verse. SUMMARY: Whether you pick up the print copy of grab the digital stories online, this new Flash is definitely worth the read! About the reviewer: Ed Garrett is a long time Flash fan, having collected The Flash and other comics since the 1960′s (when they were only 12 cents). He is a fan of Jay, Barry, Wally, Bart, and all the other speedsters who have graced the pages of DC Comics over the years. 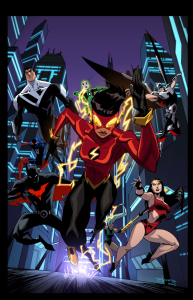 Ed uses the handle xBarryxAllenx as the administrator of The Fastest Forum Alive, a Flash fan forum. 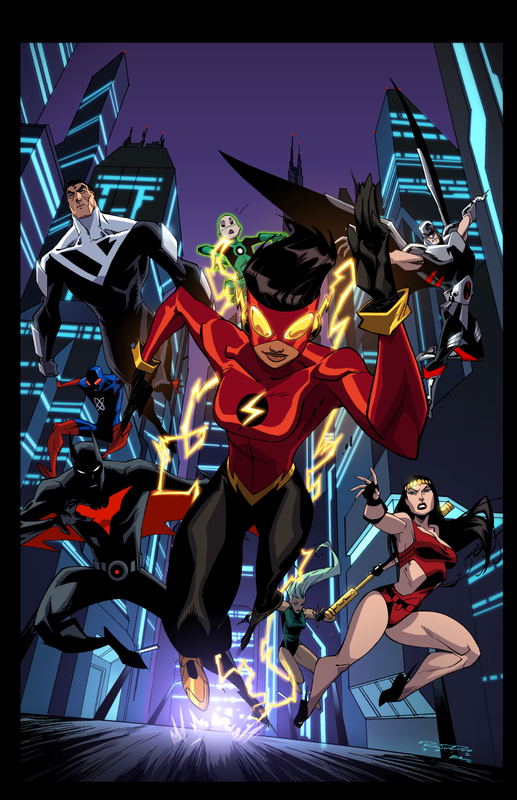 This entry was posted in Reviews and tagged Batman Beyond, Flash, Justice League Beyond on February 20, 2013 by Ed Garrett. I haven’t read it but isn’t her costume more like the new Reverse Flash than anything else?